She called them pigeons. I don’t know why. She always made a big batch of them in a large, aluminum stock pot. After the cabbage rolls were gone, the juices got turned into soup. Now that I’ve finally made them, maybe after they sit in the fridge for a day or two they’ll taste more like I remember hers did. Or maybe not. Perhaps there was something magical in her stock pot, or her kitchen, that I’m just not capturing. Or maybe everything just tastes better when MamMom makes it. BAH Tip: Don’t have a big pot to parboil a head of cabbage? Carefully cut out the core, peel the leaves off, place them in a steamer basket, and steam until softened, about 10 minutes. BAH Note: I always though she put rice in her cabbage roll stuffing. But now that I’ve made them, and used rice, I’m not so sure I’m remembering correctly. I’m leaving it out of my recipe but if you want to add some rice to your stuffing, use about 1/2 to 3/4 cup of cooked rice. Parboil the cabbage for 15 minutes. Remove from the water, cool, and carefully peel off the cabbage leaves. While the cabbage parboils, combine the ground beef and onions in a bowl. Season with salt and pepper. Using your hands, gently mix the ground beef, onion, and spices together. Place approximately 1/4 cup of the ground beef mixture in the middle of each cabbage leaf. Fold or roll the cabbage leaf up, covering the ground beef, and place seam side down in a dutch oven. Add the tomato sauce and bring the pot to a boil. Cover, reduce to a simmer, and cook for 90 minutes. The recipe sounds absolutely delicious. I wanna try it with minced chicken. Thanks for sharing. Hmmm, I’d never thought of doing the rolls with chicken. But ground chicken would probably work pretty well. let me say this about that! They are called pigeons because when they were made in Eastern europe it was thought they looked like sleeping birds……….pigeons. I have never made these without the rice. Makes the meat softer. Also ours were ablend of pork and ground beef. I have seen them made in large pots and boiled ( grammy made them that way……..slathered with 2 16 oz cans of whole tomatoes ( Maryland chief if you please) and a can of tomato paste. Add some water too. I usually make them this way. Now Grammy had a soup pot that ressembled a cauldron…………I use my spaghetti cooker with the insert inside. Keeps them from sticking to the bottom of the pot in case I forget to turn this darned electric stove down far enough! My spouses aunt makes them in a tomato gravy ( she will take that recipe to the grave) no amount of cheney’s waterboarding will pry it from her lips! then she serves them with sour cream after they have been in the oven for about 1 1/2 hours. If you want to cheat……..Minute rice works without being cooked. Ours have always had rice in them. My father didn’t like the pork beef mixture so momma just used ground beef. I prefer the mixture! Yes, you serve these with mashed potatoes and take full advantage of the flavorful vroth created by simple ingredients. And yes, they are better the second day! PROVIDED there are any left! Emily, I could see ground chicken working in the cabbage rolls. Wouldn’t be what I’m used to but it should work pretty well. Just saw one of the FN chefs doing fancy cabbage rolls and liked the idea of mixing some pork into the ground beef. I ought to give that a try. Vroth? Another freudian slip! I wear mine all the time LOL! pork changes the texture and is quite pleasant. Maybe dark chicken meat would be moist enough. Otherwise m’dear, I thnk it would be too dry. and we won’t tell grammy about the chicken……she would have a hissyfit! I completely agree that the ground chicken (or turkey) would need to include dark meat otherwise it would be terribly dry. Emmie is so resourceful! I found this on a website and it answers a lot of questions about the origin of stuffed cabbage, the origin of the many names and even a yiddish recipe! NO matzo in mine please! LOL! According to my Polish friend from IL they call them Galumpkis and they are made like your grandmothers. Try this stuffed cabbage recipe for the Passover / Pesach festival. Vegetarian recipes are sometimes a challenge to create, but I have tried to simplify this stuffed cabbage recipe by organizing the instructions into easy-to-follow steps. The following stuffed cabbage recipe is a vegetarian version of the traditional Ashkenazic-Jewish Holishkes recipe (alternate spellings: Holishikes, Holishkas, Halishkes, or Halishkas; pronounced hoh-LIHSH-kuhs). The word “Holishkes” is a Lithuanian-Yiddish translation (one of many translated versions, for instance, “Holishikes” in Polish-Yiddish) of the Russian word “Goluptzi” or “Golubtsy”, which means “little pigeons” or “little doves”, because it was thought that the packets of filled, rolled cabbage leaves resembled small birds that were at rest. “Goluptzi” or “Golubtsy goes by other names in other languages (Examples: Prakkes or Praakes – both Yiddishized words that perhaps derived from the Greek word “yaprak” which means “stuffed vine leaves”, Praches, or Golubtses, “Holubtsi” – “little doves” in Ukrainian, among many other similar-sounding or related names). Holishkes originated in Eastern Europe. Holishkes are essentially cabbage leaves stuffed with meatballs that are baked and served in a tomato-based sweet-and-sour sauce, but there are many varieties of this basic description of Holishkes, for instance, the cabbage leaves could be stuffed with a mixture of ground beef, onion, eggs and seasonings. 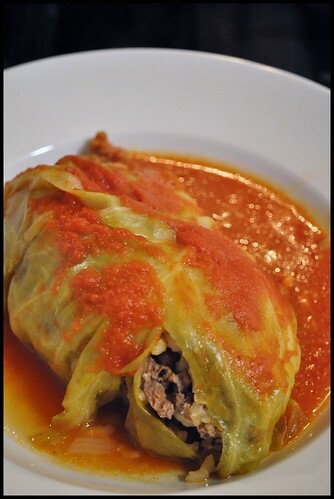 The stuffed cabbage recipe for Holishkes will vary depending on the geographical origin of the stuffed cabbage recipe. Holishkes are a traditional food served during the Jewish fall harvest festival of Sukkot (alternate spellings: Sukkoth, Sukkos, Succot, Succoth, or Succos), where they are considered a symbol of plenty, but they can also be served for the Passover / Pesach festival. The following stuffed cabbage recipe also respects the concerns of specific vegetarian sub-groups. For instance, lacto-ovo vegetarians, like all vegetarians, eat no meat but permit eggs to be consumed, and so the following stuffed cabbage recipe complies with their particular vegetarian philosophy. The practise of making stuffed cabbage began in Persia (Iran), and then spread westward to Syria and Egypt, and northwestward to Georgia, Ukraine, Russia, Poland, Lithuania, and Romania, among other countries. Since there were so many variations of stuffed cabbage recipes, a plethora of names to describe each stuffed cabbage recipe creation developed over time. By the way, the term “Ashkenazic” is a descriptive form of “Ashkenazi” or “Ashkenaz” (plural form: “Ashkenazim”). “Ashkenazim” refers to Jews whose ancestors came from Central, Northwestern, and/or Eastern Europe. Now that you’re informed of all the terminology on this web page, it’s on to the vegetarian stuffed cabbage recipe! 1.To prepare filling, combine all filling ingredients in a bowl and set aside. 2.To prepare sauce, combine all sauce ingredients in a bowl and set aside. 3.Core each head of cabbage, and place in a large pot of boiling salted water. 4.Cover pot and simmer 15 minutes. 5.Drain and cool until the leaves are cool enough to handle. 6.Discard any torn outer leaves. 7.Peel off a leaf and lay it down so that the inside faces you; if the bottom is too thick to roll, trim off some of the cabbage so it’s flexible. 8.Place leaf on flat surface. 9.Place about 2 tablespoons of filling at the core end of the leaf, roll it over once, tuck in both sides, and roll up all the way. 10.Repeat until all the filling is used up, using only the larger leaves – about two-thirds of each – head. 11.Preheat oven to 350 degrees Fahrenheit (180 degrees Celsius or Centigrade). 12.Place rolls, flap down, in a 9-inch-by-13-inch (or 22.86-centimeter-by-33.02-centimeter) baking pan or casserole, layering if necessary, and pour sauce over rolls. 13.Reserve 1 cup of sauce for basting and adding during first and second baking. 14.Bake uncovered for 35-40 minutes, basting occasionally. 15.Remove from oven, allow to cool, and refrigerate overnight or longer, or freeze for later use (thaw before reheating). 16.Cook rolls again at 350 degrees Fahrenheit (180 degrees Celsius or Centigrade) for 45-50 minutes, basting and adding sauce if needed. 17.Garnish with lemon and-or tomato slices, if desired. Isn’t it amazing what kind of information you can pull up with the push of a button? I certainly did not know that the cabbage roll had such a history. BTW Emmie is looking for an old tymey recipe for STUFFED SHRIMP. Anybody got one?